I’m planning to involve readers more in ranking sites for some of my year-end “The Best…” lists, and so thought I would investigate various web applications that allow you to create online polls and surveys. I wasn’t able to find exactly what I was looking for that would work for my purposes but, at the same time, I was able to identify a number of sites that would work great for most teacher or student surveys/polls. I have students create polls/surveys that they generally do face-to-face, but I expect that they will be making ones that could be used in our international Sister Classes Project — and those would have to be done online. In addition, our mainstream ninth grade English classes might be creating some online polls, too. * accessible to English Language Learners and/or people who are not very computer savvy. * difficult, if not impossible, to access polls that other users of the site might have made (to minimize the chance of finding inappropriate content for the classroom). * able to be embedded in a blog or website. * pretty flexible on restrictions about the number of polls created or the number of people responding to them. Some, though not all, of the sites that made this list also allow people responding to the poll to provide multiple answers to one question, which was a key criteria in the kind of survey tool I was originally looking to use for engaging readers in helping rank sites in some of my “The Best…” lists. However, none of those had one other key element I needed — the ability to restrict voters from the same IP address. It looks like I’m going to have to pay in order to get that ability, which is not one that the vast majority of teachers or students will need in online polls/surveys they create. However, I wouldn’t be surprised if some site-owners would try to vote multiple times in my reader polls if given a chance, so I would like to make doing that at least a little more difficult. I’d be interested in hearing people’s suggestions about which “for pay” service would be the best for that purpose. With Micro Poll, you can ask multiple questions, and people taking the poll can provide multiple answers. You do have to register, but it’s easy to do so. Yarp is a new web tool that very,very easily lets you create a simple online invitation or survey. I’m particularly interested in the survey aspect, and I’m adding it to this list. It has a lot of benefits: no registration is required; you can quickly type a question in and choosed various responses (a or b; true or false, yes or no); and those who respond can also write their own comments. This is a stand-out application for English Language Learners who want to use a simple survey for an in-class project or, even better, with sister classes in other places. It provides wonderful and accessible opportunities for reading and writing. Doodle is another addition. Registration isn’t required, and it’s extremely easy to create a poll that can be embedded in a blog or website or be accessed via its url address. Participants can leave comments, too. It appears to have been set-up primarily to organize group events, but it can be used as a poll for just about anything. The Make Use of blog has an extensive explanation of how it works, though it’s pretty darn simple. Obsurvey is a very flexible and easy web application for making online polls/surveys. The Answer Garden is an intriguing combination of a survey tool and a word cloud generator. 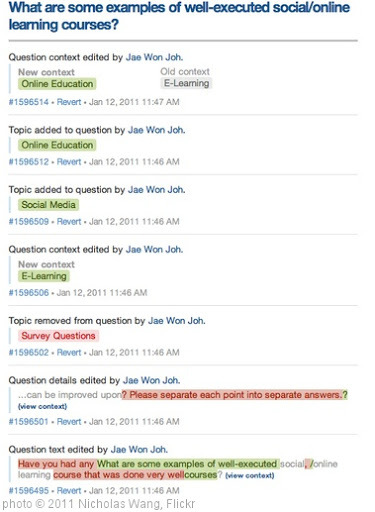 Without requiring any registration, it lets you pose a question to which people can write their own short answers. The answers appear as a word cloud below the question, with the words changing in size based on how often they are used in responses. Responders have the option of writing in their own answer or clicking on one of the words already in the word cloud. The entire “garden” can be embedded in a blog or website, and you can also link to it. The fact that anybody can answer anything to the question without identifying themselves makes it problematic — to say the least — in many school settings. But in certain mature situations, it could be very useful. SurveyMapper is a tool to create simple surveys. It’s unique twist, though, is that it also shows you a map (of U.S. states or countries in the world) of where the people who answered the question live. Just because it gets “points” for being creative in a crowded field, I’m adding it to this list. I’m not very impressed with the features that are available for free from Survey Monkey, but that’s the service I use when I have a poll on this site. I need to pay a few bucks, but it makes things easy if you are doing a larger poll. Kwik Surveys is a new online survey tool. Riddle looks like an exceptional site that you can use for creating a survey or a quiz. Thanks to reader Fred Armstrong, I learned about Votesy, a free and simple survey tool that lets you ask one text, image or video-based question. Get Acquainted is a very intriguing online survey tool that creates “conversational polls.” I’d encourage you to read Richard Byrne’s post and watch his video about it. It really does seem super-easy to use, and the polls are embeddable. Pollsify is a new online polling tool. It’s in beta now, and says that everything is free – for now. It’s unclear how long, however, it will remain that way. Have you tried making a survey in Google spreadsheets yet? I think that’s a pretty cool tool, but probably doesn’t have the IP features you’re looking for. Actually, I did check it out because I had seen you had used it for the poll in your blog. But, you’re right, it didn’t have the IP feature I need for my poll, and it seemed too complicated for an English Language Learner or a non-computer savvy person so it didn’t make my list. We are glad you’ve discovered Vizu, and pleased that you were happy with our free Web Polls. I wanted to specifically address your security concern. Vizu has created several mechanisms that restrict a user from voting more than once on a poll. A site that regularly uses our polls, http://www.dealbreaker.com/ currently has a poll running just underneath its Top Stories feature. Please feel free to vote, refresh your page, or go to a different site, and then revisit, and you will see that only the results are shown and you may not vote multiple times. I hope that helps to clear things up a bit. Please feel free to contact me with any questions. Thank you, Larry, for another great list of web app’s! I was going to suggest Google Spreadsheets and forms for data collection with English as an additional language learners, too. Nevertheless, if learners indeed need linguistic support, as they are familiarizing themselves with more and more tools to use with a single online account, Google settings offer displays in almost 50 linguistic and varietal flavours. I’ve used http://www.polleverywhere.com with students as young as 4th grade. Fits most all of your criteria. Great and useful list as always. I do have a question. Have you seen any surveys/polls that i can take “live” For example, as I present a workahop, can I somehow “pollk” the group for answers to questions like Grade level, How many Computers in their class/lab and then get results by show of hands, record it as 6 for Answer #1 and 8 for Answer#2, etc. I would like to then show the results right after I recorded them. Any ideas? Finally – its not a suvey site but you could use it this way and I feel it should be on your light somewhere is the http://www.mysignup.com/ I have not quite found anything like it (for FREE anyway) Its a bit of pain to set up for its free and actually I don’t mind paying $3 to remove the ads to I can cleanly embed on a web site. For simple, attractive classroom surveys, e.g. to gather some real, relevant data in under 5 minutes for info handling, I’d recommend Google Forms. They’re available as part of Google’s public service, or as part of Google Apps for Education. I find teachers like the ease of use, the simplicity, the attractive theme designs and the automatic data capture to a matching Google Spreadsheet, which avoids any need for exporting captured data, then importing it into a spreadsheet. For the heavier duty surveys, I’d recommend Limesurvey (http://limesurvey.org). It’s free, but you do need a bit of web space to install it. It offers huge functionality, but is easy enough to use for relatively inexperienced teachers to make good use of it after a 10 minute intro. It’s “Quickstats” feature will automatically generate high-quality pdf reports of surveys, with charts if required. That’s proving a huge time-saver for us. Hi Larry – Thanks for including http://www.Swayable.com in your list! Quick note that you can not only create Swayables online or on the iPhone (soon to be Android as well) but you can also embed them right in your blog or website just like you can with YouTube Videos. Our engagement is averaging over 10% for embedded Swayables. If you are a student and in need of a free survey tool, you should check out our site: Survey Prof.
SurveyProf is a free survey tool which has been developed for students, which allows you to create an unlimited amount of surveys with unlimited questions, responses and running time. Good luck with your surveys! I stumbled upon Smart Survey the first time I needed to conduct a survey, and I would recommend them to anyone. I rarely hear about them around the internet, but they appear to have a large customer base. It’s never failed to impress me. It’s worth adding the link because of the dash between the words. I am using http://www.sogosurvey.com for the first time for survey creation and am pretty impressed with their way of report structure. Another option for survey site would be http://www.surveymonkey.com as a second preferance. Even though this is an older blog, this was VERY helpful. Thanks! I find SoGoSurvey.com to be a pretty formidable survey maker. The interface is sophisticated and easy to use. For me, the other big name sites had limits with their basic free platforms and this became a problem when working on a more complex survey for my thesis. The best part is that if you are a student, SoGo will provide you with a free license. You won’t have to worry about dealing with the high costs on the other sites. So I’m with SoGo. I look forward to seeing everything that it can do. I find http://www.mobosurvey.com to be simple and fast. I like how the survey/poll shows up on my iPhone. Survey Face is a free online Survey tool, offers unlimited surveys, responses, Address book maintenance, Track responses and reminders, Automatic response alerts, PDF, EXCEL, CSV, HTML and XML Reports, Share Results, Password Protection and much more. You can visit Survey Face at http://www.surveyface.com. Aapkapoll.com is a user-friendy website for creating online polls and get feedback in an instant. Special Service For WebMasters/Blog/Website Owners!! Some of the features of Special Account are as under:-..
Just create an online poll, quiz or contest and Manage the poll through our Website. Analysis of the poll result available on request. I recently discovered them as an alternative for my previous tool. They provide a very impressive interface. Hey! I have had a good experience with ProProfs survey maker(http://www.proprofs.com/survey/). It is the most economical survey maker that i have ever come across and is worth the bucks you spend on it. Cheers! I would recommend SoGoSurvey! You can create surveys, quizzes, polls as well as forms on its easy platform. What I really love about the online survey software is that besides its basic Free Plan, it offers its Professional Plan for free to students, faculty and non-profit organizations. How cool is that?!!! I’ve tried all of the sites mentioned above and actually quite a lot more, but the one that stood out most for me was Super Simple Survey, which can be found at http://www.supersimplesurvey.com/. They don’t have as big a name as Survey Monkey for example, but in terms of what they have to offer they are very much comparable. What is most obvious about them is their focus on simplicity, and this just makes it an awesome site with lots of potential. –	Mobile devices are more and more used for surveys: on the one hand, online survey vendors make the move to mobile-friendly surveys. On the other hand, ‘mobile first’ survey vendors enter into the game – such as http://surveyswipe and http://surveyanyplace; these vendors typically make use of the specific mobile functions such as GPS, photo capture,.., to enrich the data collected through the surveys. –	CRM players such as http://zoho.com are offering surveys as part of their platform. Other CRM players such as http://salesforce.com offer -through a marketplace – a wide choice of apps, including survey apps. -Survey tool vendors start to offer panel surveys accessible from their tools. A vendor to watch is Google Consumer Surveys, as they are able to use Google’s existing intelligence to reach thousands of respondents in a targeted way. Basically, the free tier has all the awesome features (nothing is limited), and you can get 150 responses before needing to upgrade. And if there’s anything you’re missing, just drop us a line and we’ll make it happen. I think http://www.qfeast.com is simply gorgeous if you want to create or take quizzes! It’s easy, free, you can create scored quizzes and personality quizzes and also polls, questions, stories, groups. That’s a great list Larry. I encourage you to check out http://surveynuts.com which is a neat survey tool we’ve created as well ! According to me, SoGoSurvey is the best online survey tool in the market. They offer many features like branching, advanced branching, multi-lingual surveys, and many more in their free plan. Also, their Pro plan is cheaper as compared to the other survey tools. SoGoSurvey offers free upgrades to the students and the non-profit organizations. It’s a highly recommended tool. Visit http://www.sogosurvey.com/ for more information. The list proved to be very helpful, Larry. Thank you very much. I have just used polldeep.com that provides free package as well as paid packages. I have found it promising as it provides deeper analysis of data collected in poll process. Worth using it. Thank you Larry for this almost perfect list of online poll/survey creators. However I do feel that Polldeep should also be added to this list given its ability to conduct amazing results. Latest features and super service has made it a name to reckon with in this industry. Opinzo is another solution which is considered best for conducting online polls. Votesy.com is another poll making website you may want to add to the list. The list you’ve prepared works good for me in today’s date as well. I was looking for sites with easy to create and access polls, and your suggestion of Polldeep was a boon for me. Thanks! Thanks larry for sharing. Surveys are very important for successful running of any business. Other than Google Forms, I’d used Polldeep for online polling and it proved quite beneficiary for gathering opinion from the audience.